If the drought continues in the western United States, California farmers may consider planting solar panels rather than crops in the years ahead. This potential shift is consistent with the increase in renewable energy production and the growing influence of drought in the region. 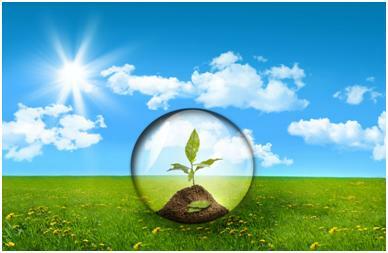 During the last 20 years, there has been significant attention on sustainability initiatives. States, utilities and various networks such as the Regional Greenhouse Gas Initiative and the Western Electricity Coordinating Council continue to work on carbon dioxide emission reductions. The works of Robert Agranoff indicate that collaborative efforts can be utilized to address regional or borderless challenges. Environmental sustainability often requires the integration of policy, citizen participation, science and technology. Many states utilize renewable portfolio standards to reduce carbon dioxide emissions from electricity generation according to Database for State Incentives for Renewables and Efficiency. Since 1997, many new sources of renewable power across the country were constructed and added to the electrical grid as a result of renewable portfolio standards. Furthermore, many new renewable energy plants were constructed by utilizing contracts between the private sector and public utilities. The use of contractors to bolster public capacity is well documented in the works by Donald Kettl and suggests that monitoring of contractors and transparent metrics can support successful outcomes. Global warming has been the impetus for additional renewable energy production in recent decades. However, in recent years the effects of drought are becoming more prevalent. Drought conditions are forcing public administrators to take a closer look at water intensive activities in affected areas. Recent maps from the National Integrated Drought Information System suggest that significant portions of the western United States are currently impacted by drought conditions. The drought crisis in California is so severe that Governor Jerry Brown declared a state of emergency in January 2015. The Federal Environmental Protection Agency recognizes the nexus between electricity production and the consumption of water. The existing drought conditions may warrant an increase in the amount of renewable energy generation from water-wise renewable energy sources such as solar, wind and biomass. Furthermore, as the agricultural industry suffers from the effects of the drought, the opportunity to start solar farms on water choked parcels in drought ridden states may offer farmers financial relief in the short and long term. The decentralized nature of the drought will require public administrators to develop solutions that are contextually specific. Approaches in rural settings may differ significantly from those in urban settings. Water equity issues are likely to become more pronounced as the drought continues in the months ahead. Ultimately, public administrators and citizens will need to take responsibility for water consumption in their respective states and homes. Author: Dr. Brett Koontz is an assistant professor in the Department of Environmental and Occupational Health at California State University, Northridge. You can email him at [email protected].